LishaBora's business model has been in an innovation and re-design stage over the last year. Throughout these changes we've gotten many questions from our investors. It made us realize, that if our investors have these questions, it's likely the general public does too! So we've compiled all of these questions into our SAWA Series (Someone Asked We Answered) in spirit of the Kenyan culture where we hear "sawa sawa" on the daily. This month we're focusing on our next steps, diving directly into our future vision and plans to scale so that we can increase our impact on smallholder farmers in Kenya’s informal dairy market. Question: What are your plans to scale? How many farmers and traders do you anticipate to reach? Answer: Our vision is to be the supply chain platform for East Africa, spreading high quality goods and business management solutions across the region by harnessing the power of entrepreneurs in rural communities. LishaBora’s vision is to be the last-mile distributor for rural East Africa spreading high quality products and best farming practices across the region by harnessing the power of micro-entrepreneurs through business development and credit solutions. 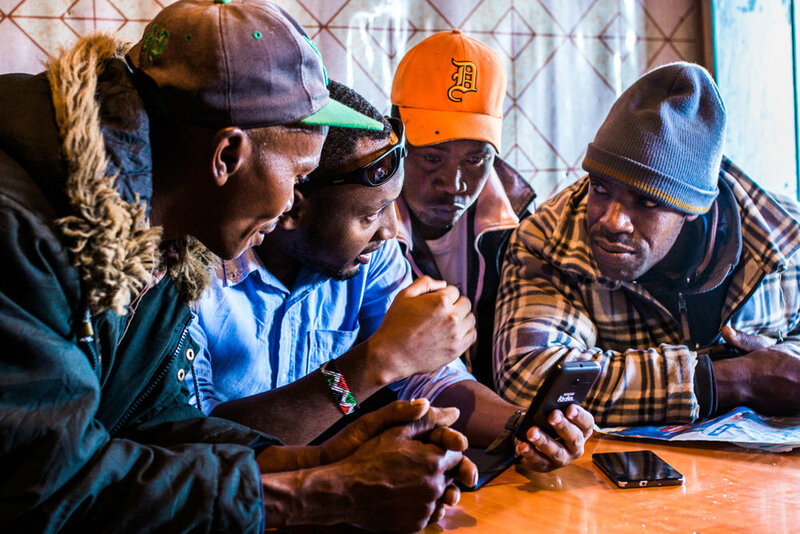 Our business management mobile application provides economic opportunity to over two million smallholder dairy farmers and 45 thousand informal door-to-door milk collecting entrepreneurs in Kenya. At scale, it has the potential to impact millions of smallholder and SME beneficiaries. 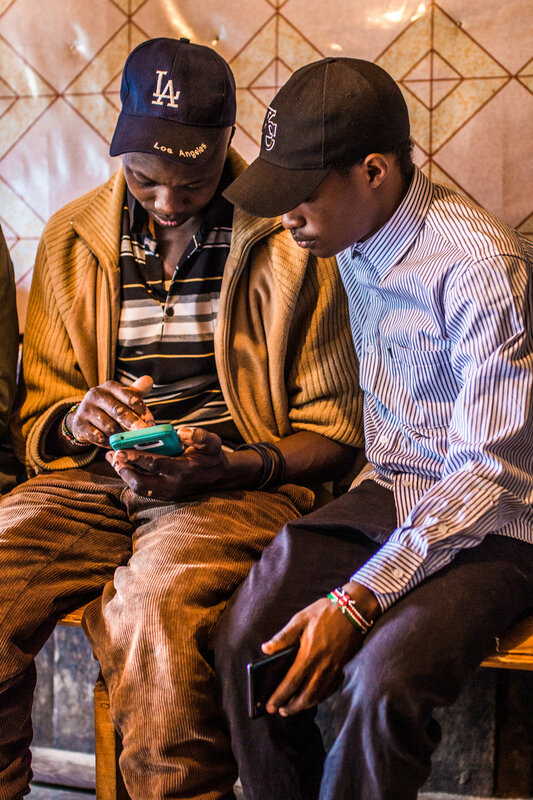 Through our mobile application, we will improve lives by providing informal smallholders and entrepreneurs with increased milk production revenues through access to high-quality inputs, financial inclusion, and improved business management through our Android mobile app. By leveraging the existing trust-based social infrastructure of the informal sector, LishaBora can scale quickly to millions of smallholder farmers. Our current revenue source comes from the sale of cow feeds, and we envision future revenue sources being generated from selling a larger range of products and services, such as poultry products, house staples, or farming equipment, and from charging small commissions to traders who use our application for managing their farmers’ payouts. With dairy traders building long-term financial histories, LishaBora can be the liaison for larger asset loans such as milk chillers or vehicles from banks and RFIs (Rural Financial Institutions). Using the dairy industry as a launch pad, our application can be used to mitigate the issues of informal segments (including cash-flow and growth-restricting inefficiencies) in any sector across many global value chains such as tea, coffee, or cereals. Kenya’s customers are the over two million smallholder dairy farmers in Kenya contributing to 7% of Kenya’s 70 Billion USD GDP. Smallholder farmers are key players in Kenya’s agriculture industry and entire economy, however, they are the least profitable player in the value chain and yet the most critical. These farmers are only managing to produce 30% of their cows’ milk potential due to high cost of inputs, poor access to market, and poor management practices resulting in farmers earning less than 2 USD per day. The current value chain is filled with distrust between smallholder farmers and feed producers that push their dry-feed products, a 1.5 billion USD industry, to account for 80% of a farmer’s costs. These players are making immense profits off the backs of the smallholder. Farmers equate best dairy practices with the best dry feed product while forage management, cow hygiene, health and comfortability, and strong book-keeping practices are afterthoughts. Previous interventions have only focussed on the formal market and this is where we are different; LishaBora is the only organization to work at every point along the dairy value chain with both the formal and informal market to build the long-term trust needed to solve the systemic issues of low milk production, high input cost, and low point of sale for the farmers. 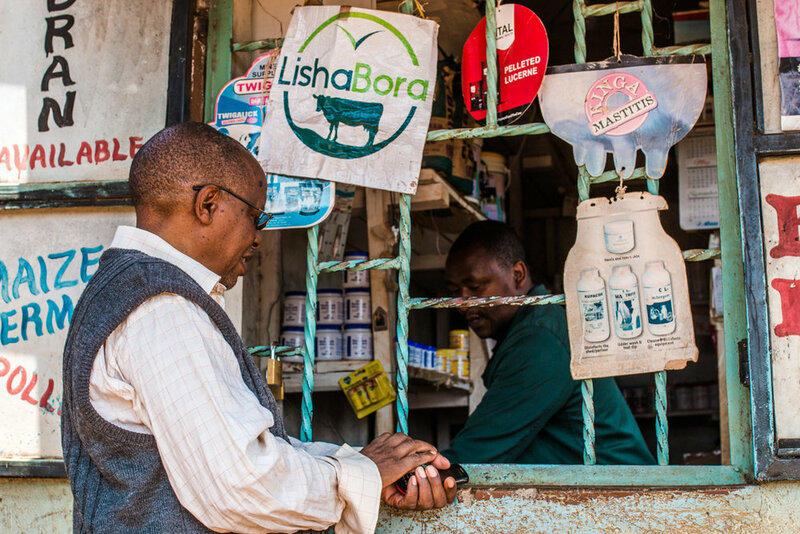 LishaBora is the only company working within the informal dairy market to digitalize, improve bookkeeping practices, and grow a dairy trader’s business. We have found no other company in Kenya working in this space. Our differentiator is our business management mobile application, a tool that dairy traders use to digitalize the daily processes of milk collection, accounting, and bi-monthly bulk payouts to their farmers. We provide the dairy trader business metrics and data analytics. The data collected from daily milk collection paired with bi-weekly payouts builds credit and makes farmers bankable who have had no previous access to these types of institutions. Through this application dairy traders sell LishaBora’s high-impact products and services that raise incomes of smallholder dairy farmers. When we partner with a trader and the farmer buys our dry-feeds and animal health products, we conduct a seminar to teach them how to store grass for the dry season and how best to take care of their cow to boost their profitability. LishaBora’s success and the success of farmers and dairy traders are intrinsically connected. Our organization’s growth is tied directly to the number of dairy traders we get consistently using our business management mobile app. For every trader we get using our app, we gain market access to an average of 60 farmers to offer our products and services to. Once a new dairy trader signs up, we hold a “best farming practices workshop” on a quarterly basis for their farmers. Our milestones include growing 15 traders in six months, 30 traders in one year, and 100 traders in two years, we will need to build our field staff to 30 LishaBora Farm Consultants who consistently work with the trader and their farmers. At present our field team consists of 2 Sales Representatives and 1 Quality Assurance Officer to oversee the testing and troubleshooting of the mobile application in the field. Our mobile application platform is very diverse, with the technology performing functions for accessing high quality products and services in both the agricultural and non-agricultural sector, as well as becoming a tool for financial inclusion for Kenya’s rural communities. Our application has the ability to place orders for products, offer micro-loans to farmers and track daily business transactions for better financial planning. Currently, our primary source of income is from our Jawabu Cow Feeds. We envision our mobile application and business model leading to future revenue from the off-take of selling and collecting milk products, purchasing a wider range of agricultural and non-agricultural products and offering large scale lending solutions to rural communities. In 2019, we will start charging traders $0.05 USD per liter of milk to process it and sell it to the open market. 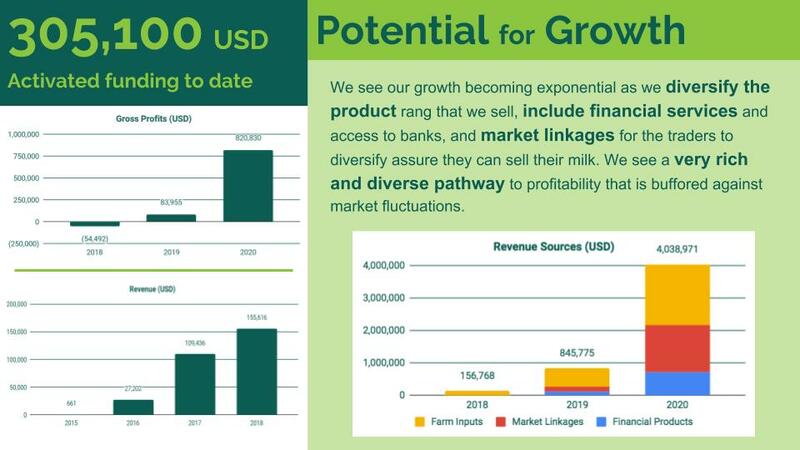 LishaBora will take advantage of our exclusive access to this market, and add an additional 1.5 million USD to the bottom line by managing the milk collected by traders and increasing access to market. This will add an additional revenue source for LishaBora, while increasing the profit that traders and subsequently smallholder farmers earn per litre of milk as they can sell it for a higher price/litre in urban markets like Nairobi city centre, which they currently do not have access to due to location and transportation logistics. We are currently building out our range of products on our mobile application platform that traders can sell to their smallholder farmers. From our human-centred design studies, we know that our customers desire products such as: additional animal feeds (calf, chicken, cows); animal health products (vaccinations, dewormers, medicine); agricultural inputs (seeds, fertilizers, farming machines) and household products (sugar, unga (flour), maize meal). We realize that our start-up does not have the capacity to manufacture all these products, but through our mobile application we do have the capacity to act as a distributor, improving the access to a wider range of good and services for our smallholder farmer customers! This will add nearly 2 million in revenue from products sold yearly. In early 2019 we will start providing lending facilities to traders and farmers offering small loans. With interest rates less than any other bank, we will be able to add nearly 1 million USD to our bottom line through issuance of these loans. We have heard it from our customers time and time again that they desire to purchase assets for their household but do not have the cash flow at hand. Through LishaBora’s mobile application, farmers are creating financial history records that could be used as credit scoring solutions. By partnering with RFI’s (Rural Financial Institutions), LishaBora can ensure the credit scores of it’s customers and dairy trader partners, and improve the quality of life for rural households. LishaBora is currently based in rural central Kenya and we are successfully marketing throughout the various counties in the region, with plans to expand throughout Kenya and the East African region. Our current projections with donor grant commitments would introduce a cumulative increase of $210,000 in monthly value generation for smallholders and entrepreneurs. With donor funding we can expand: our operations to serve an additional 100 dairy collecting entrepreneurs who would each earn an estimated $1,810 in additional revenue/month; 5,000 smallholder farmers who would each earn an additional $180 revenue representing $60 in profit monthly; allow LishaBora to reach net profitability of our core business; fund research and development to improve our supply chain and develop our product line; pilot our lending portfolio to further increase our impact; and gain exposure to attract additional impact, angel, and/or venture investors. Our primary key performance indicators (KPIs) in measuring the impact of our business model are focused on the measurement of increased revenue and profit from our entrepreneurs and smallholder farmers. This is accurately measured by the quantity of litres of milk managed by entrepreneurs and the quantity of litres of milk produced from smallholders before and after LishaBora intervention. Additional KPIs include measuring the buying price of the milk to determine profitability throughout the supply chain. We also measure the number of trainings completed and the identified qualitative positive economic changes in the households of our entrepreneurs and smallholder farmers. Our prototype business management mobile application was launched in July 2017. Realizing the profitability, scalability, and impact we can have with this model, LishaBora has been developing our application and identifying potential traders that we will launch with. Now that we have 13 traders officially onboard, LishaBora is about to embark on an ambitious plan, scaling our mobile application to hundreds of traders who work with thousands of farmers. Informal sectors make up a large amount of developing countries economies and drive billions of dollars of value to the lowest income peoples around the globe. The problems facing these industries are highly complex, multifaceted, personalized, and inefficient. By creating a platform and distribution standard with the dairy industry in Kenya, we will be able to replicate and scale to other areas of business that have similar farmer-trader informal dynamics. LishaBora can be the leader in digitalizing the informal sector, providing shared value to the most disenfranchised, and building a sustainable and profitable business that can be a model to others. The value of Kenya’s dairy industry doubled from 2008 to 2012. In the coming years this sub-sector has potential to play a significant role in reversing poverty levels. LishaBora is the only company working directly with informal traders, giving us unrestricted and first-time access to a huge, decentralized market. Our distribution and marketing strategy utilizes the networks of informal dairy traders in rural communities. Using targeted interactions where traders are operating to get introductions, we have found considerable interest from traders, opening up new potential markets. With such a high value of each end-user for the app, we are able to have rich, personal interactions with each trader, building personal relationships and developing a strong understanding of their business. This approach positions ourselves as a strategic business partner that grows the trader’s business, legitimizing them on the market. Our field and sales staff have found getting introductions and on-boarding with traders a quick and simple task. LishaBora leverages the existing trust-based system between dairy traders and smallholder dairy farmers in the informal market, using digitalization to solve the cash flow issue farmers face when purchasing dairy products and services. The same cash flow issues exist in other informal segments such as poultry, tea and grains. We will use dairy farming as the launch point for a platform that provides smallholders with the products and services they need paired with the financial services necessary to deliver those products effectively and affordably. Then LishaBora will expand into other informal agricultural sectors and geographic regions. All informal segments of any agriculture sector are based off trust between farmers, input providers, and entrepreneurs. LishaBora will use our existing platform, modify it to fit the specific sector, and then understand and engage in the trust-based system unique to that specific agriculture sub-sector. It’s what we do best. Have a question you want answered? Email us at info@lishabora.co.ke today and we will do our best to incorporate your question in one of our upcoming monthly SAWA series blog posts. LishaBora is introducing a monthly SAWA Series (Someone Asked, We Answered). In this series we will be answering questions our investors and followers have posed regarding our business model, revenue projections, impact metrics and more. Have a question? Send it to info@lishabora.co.ke to be featured in an upcoming blog post. We drove out on our motorbikes to visit John Njenga Karinga. John started his own duka (small shop) where he serves 80 customers from his hometown of Kahuruko in Kiambu County. He has owned this store for 5 years and his committed to providing his customers with the best animal health products. John is also a smallholder farmer with two cows and is knowledgable about best farming practices. One year ago, he started trading with LishaBora and is currently distributing our 70kg Standard and Premium Jawabu cow feeds. He uses LishaBora feeds for his own cows because of the high quality and the improvement he’s seen in milk production. John was excited to learn that LishaBora will soon be manufacturing it’s own Kienyeji Chicken Feeds as he knows there is a large market demand for better quality animal feeds. George Waweru Nyaga has been a dairy trader for 7 years. He has a network of 43 smallholder farmers in his village Kigongo near Kibichoi town whom he collects milk from twice per day. He's excited about the prospects of our business management mobile application to grow his business and sell our high yield Jawabu Dairy Meal (cow feed) to help increase the milk yield of his farmers. Peter Kamau is a 28-year old business entrepreneur from Kambaa, Kenya. Peter is the first dairy trader to partner with LishaBora and pioneer the use of our business management mobile application to grow his business. In this blog post, we join Peter on his afternoon milk collection run where he collects from 55 smallholder farmers, and hear his insights on the dairy industry in Kenya's informal market. LishaBora celebrated it's 3 year anniversary as a start-up social enterprise operating in Kiambu, Kenya on January 30th. This blog post shows how the business strategy has transformed over time bringing innovation of agriculture and technology to Kenya's informal dairy sector. LishaBora is empowering smallholder farmers, and women in rural communities of Kenya through it's quarterly best farming practices workshops. These workshops are held by our highly knowledgeable field staff whom are experienced dairy farmers themselves. At these workshops, we share techniques of good farm management, cow health and hygiene, usage of silage and dairy meal to increase milk yields.